A member of Team Cote D’Ivoire peers off into the crowd of supportive fans during the Special Olympics World Games Opening Ceremony on Saturday. 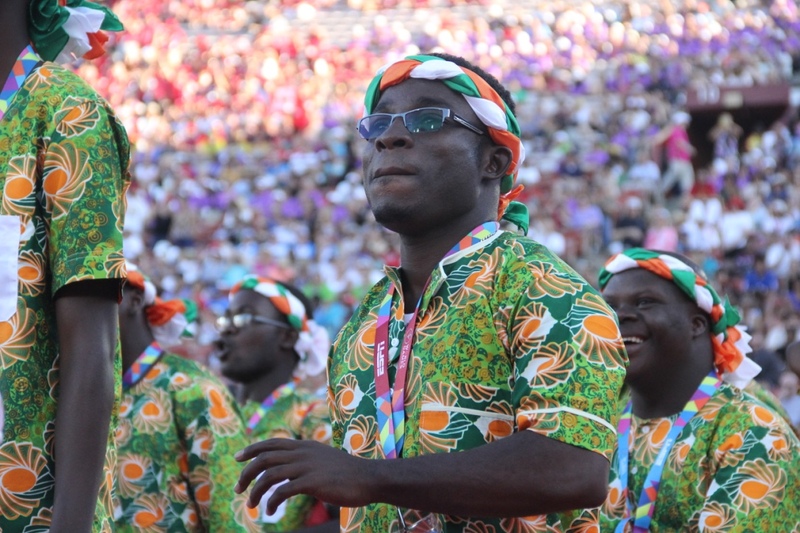 Fans show support for their countries during the Special Olympics World Games Opening Ceremony at the Los Angeles Memorial Coliseum on Saturday. All smiles during the Special Olympics World Games Opening Ceremony, as the athletes from France make their way onto the field at the Coliseum on Saturday. Team Bangladesh greets the roar of the World Games fans with pride and joy during the Special Olympics World Games Opening Ceremony on Saturday. A team Bangladesh athlete gets hyped for the commencement of the 2015 Special Olympics World Games in Los Angeles on Saturday. An athlete from team India throws up the deuces as he makes his way from the entrance tunnel to the Coliseum field during the Special Olympics World Games Opening Ceremony on Saturday. An athlete from the Bhutan team appreciates monumental experience during the Special Olympics World Games Opening Ceremony on Saturday. Athletes jog out of the tunnel and into the limelight as they wave their towels above their heads in excitement during the Special Olympics World Games Opening Ceremony on Saturday. A Bulgarian athlete reaches up for Los Angeles, overwhelmed with happiness during the Special Olympics World Games Opening Ceremony on Saturday. Team Canada brings the fire to the Opening Ceremony, and the crowd responds with cheers of their own on Saturday. Costa Rican teammates represent their home country with a sign of support during the Special Olympics World Games Opening Ceremony on Saturday. An athlete greets the thousands of cheering fans with a hat wave and wonderment during the Special Olympics World Games Opening Ceremony on Saturday. A Team Ecuador athlete admires the unwavering support of the Coliseum fans during the Special Olympics World Games Opening Ceremony on Saturday. A Team Finland athlete captures this exciting moment and waves to fans during the Special Olympics World Games Opening Ceremony on Saturday. Team Finland captures this exciting moment and waves to their fans during the Special Olympics World Games Opening Ceremony on Saturday. Hong Kong athletes carry their country flags with pride during the Special Olympics World Games Opening Ceremony on Saturday. A Team Iceland athlete greets the fans in the stands with open arms during the Special Olympics World Games Opening Ceremony on Saturday. Team Iran walks through the tunnel and onto the field with a sense great appreciation during the Special Olympics World Games Opening Ceremony on Saturday. Two members from Team Iran pose happily for the camera during the Special Olympics World Games Opening Ceremony on Saturday. An athlete from Ireland shows his enthusiasm as he enters the Opening Ceremony on Saturday. A Team Jordan participant gazes out at the sea of people before her during the Special Olympics World Games Opening Ceremony on Saturday. Two athletes from Team Korea display their joy with a quick wave during the Special Olympics World Games Opening Ceremony on Saturday. A Special Olympics coach fist pumps the sky with his passion for the games during the Special Olympics World Games Opening Ceremony on Saturday. Team Malta athletes parade on the field under the setting Los Angeles sun during the Special Olympics World Games Opening Ceremony on Saturday. A coach from the Mexican Special Olympics team surveys the stands with tears in his eyes and joy in his heart during the Special Olympics World Games Opening Ceremony on Saturday. An athlete embraces the warm welcome from the fans by reaching out to the world around him during the Special Olympics World Games Opening Ceremony on Saturday. Two athletes from Norway walk hand-in-hand into the stadium during the Special Olympics World Games Opening Ceremony on Saturday. A Russian coach marches in with honor for her country during the Special Olympics World Games Opening Ceremony on Saturday. Athletes from Team Senegal stride in the Coliseum in their country’s cultural garments during the Special Olympics World Games Opening Ceremony on Saturday. A member of the South African team relishes in the her moment of fame during the Special Olympics World Games Opening Ceremony on Saturday. Team Venezuela embraces Southern California by throwing up the shaka during the Special Olympics World Games Opening Ceremony on Saturday. An athlete from Team USA flashes his joy and excitement to the fans during the Special Olympics World Games Opening Ceremony on Saturday. A fan looks on at the hundreds of athletes marching into the Coliseum and taking their seats during the Special Olympics World Games Opening Ceremony on Saturday. The line leaders gather on stage to represent the diversity of the Games during the Special Olympics World Games Opening Ceremony on Saturday. The Los Angeles Coliseum is filled with 60,000 fans during the Special Olympics World Games Opening Ceremony on Saturday. A Korean athlete watches the Opening Ceremony performances at the Los Angeles Memorial Coliseum on Saturday.